The Kellogg brothers’ spa served health food that still sounds trendy. When you think of healthy, trendy food, avocado toast or artificial meat may come to mind. But 120 years ago, Michigan’s Battle Creek Sanitarium was ahead of the curve. Health-seeking patients ate meat-free, grain-filled meals designed by the wealthy, influential inventors of Corn Flakes. Dr. John Harvey Kellogg and his brother William Keith Kellogg invented breakfast as we know it. The Kellogg cereal empire started in Battle Creek, Michigan, at the Sanitarium, a health spa run by the Kelloggs and backed by the Seventh-Day Adventists, a Christian denomination. Both brothers were Seventh Day Adventists, and their health theories dovetailed with Adventist strictures limiting meat, alcohol, and caffeine consumption. But these limitations didn’t bother famous Americans such as Amelia Earhart, Henry Ford, and future President Warren G. Harding. All three of them flocked to Kellogg’s health facility to eat what the doctor ordered. The Sanitarium was a booming business. Thousands of patients came in search of a cure for the painful indigestion caused by heavy, meat-filled diets—a near epidemic at the time. For those who couldn’t make it to Michigan, Dr. Kellogg published cookbooks and manuals promoting the Sanitarium’s exercise and nutrition guidelines, as well as products such as his wheat-based, flaked cereal Granose. Kellogg intended this bland diet to fight both Victorian digestive troubles and the “problem” of sexual arousal. (He believed that food could cause impure thoughts.) But it was William who successfully commercialized a corn version of the cereal, causing a brotherly rift when he left to found the Kellogg’s cereal company in 1906. In this Sanitarium dinner menu from May 1900, some items sound familiar and tasty, such as mashed potatoes and caramel cereal. Other foods sound strange. Boiled milk and gluten fruit gruel are filed under “Liquid Foods,” and the sole salad is something called Protose. Protose was invented by the Kelloggs and advertised as “vegetable meat.” With main ingredients of protein-rich wheat gluten and pureed peanuts, it was popular with health food fans and vegetarians alike. In the early vegetarian cookbook Substitutes for Flesh Foods, a recipe for Protose Salad included Protose chunks, cold boiled potatoes, chopped celery, and mayonnaise. 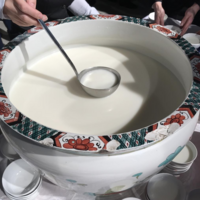 Patients from around the world dined together in the Sanitarium, but instead of sharing coffee or tea, they drank kumyzoon, a fermented-milk beverage based on the Central Asian horse-milk drink kumis. Also available were five kinds of toast. While prune toast and egg toast are fairly self-explanatory, snowflake toast is not. An 1897 recipe calls for coagulated egg whites and hot milk over toasted bread, perhaps creating a frothy, snowy effect. While snowflake toast’s time has passed, other Kellogg innovations had a longer lifespan. Protose and Nuttola-like nutmeats were enjoyed well into the 20th century, and Kellogg cereals—as well as graham crackers, which they popularized—are still on the menu. Just usually not as dinner. Doctors and folk practitioners alike swore by its healing properties. "The sun, God, and the coconut were like Father, Son, and Holy Ghost." Those looking to self-medicate could score at the doctor's office.